Commercial kitchens by nature are constant fire hazards. With new high-efficiency, high-energy appliances and vegetable oils having high auto-ignition temps, a kitchen fire is only too probable. 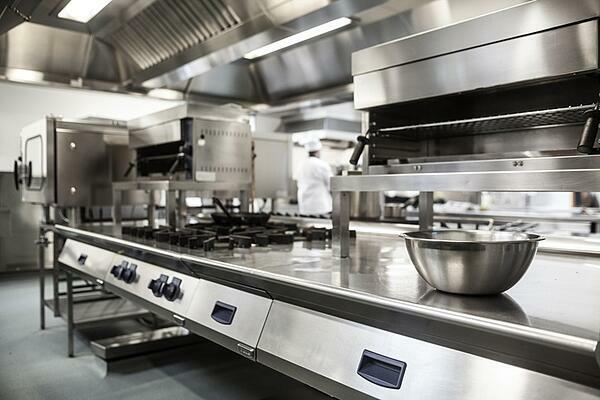 But many kitchen owners assume that since they installed their pre-engineered fire suppression systems, they no longer need to possess fire extinguishers for their kitchens. This would be a wrong assumption. Not only do you need to still supply an extinguisher – you need to ensure it is the right type as well. WHY DO I STILL NEED A FIRE EXTINGUISHER IN THE KITCHEN? The simplest answer is because the National Fire Protection Agency in NFPA 10 dictates that you must have at least one fire extinguisher ready for use in the kitchen. In addition to being mandated by fire protection code, there are also many other reasons why having an extinguisher in your kitchen area is important. Kitchen fires, or class K fires, involve high-energy appliances combined with vegetable oils that have high auto-ignition temperatures. When these fires ignite, they’re already extremely hot, and the presence of the oils and grease (which can easily spread) make it a volatile situation. The more defenses available against such fires, the better. While the hood fire suppression systems are extremely effective, they may not always be sufficient to extinguish the fire, especially if any oil or grease has spilled, spreading the fire. For these reasons, the NFPA still requires that commercial kitchens include a class K specific fire extinguisher. WHAT IS A CLASS K FIRE EXTINGUISHER? A class K fire extinguisher is an extinguisher specifically designed to be effective against the intense heat and fuel of class K fires. There are numerous types of class K fire extinguishers to choose from, including both dry chemical and wet chemical options, as well as many size options. Per NFPA code, class K fire extinguishers should not be discharged until the hood or appliance fire suppression system has already been activated. This is to ensure that both methods of fire suppression are in place, which when combined, are far more likely to successfully suppress the fire than if only the extinguisher were used. It is important you are familiar with the specific suppressing agent in your class K extinguisher, as some of them do conduct electricity. If this is the case with your class K extinguisher, then it will also be important to make sure power has been shut off to the kitchen appliance prior to discharging the extinguisher. The answer, as it often is for such questions, is: it depends. At a minimum, you must provide at least one class K extinguisher for your kitchen. However, if you have particularly large or multiple hazards, the number or size of the extinguisher may need to increase. For instance, according to the IFC (International Fire Code), one 6-liter extinguisher should be present for every four fryers with 80 pounds of capacity each (320 pounds total). If you should have more fryers of that size or multiple fryers of greater size, then you will need to provide additional extinguishers. Do you have the correct class and number of fire extinguishers protecting your commercial kitchen? If you are not confident about whether you have supplied the correct number, size or class extinguisher, or if you would like a fresh evaluation on the fire protection in your kitchen, contact the experts at Koorsen today!